1. Monday. The majority of all people who come to Antarctica with the US Antarctic Program do so via McMurdo Station an one of our 3 air strips. As the seasons and ice conditions change we must move our landing facilities. Around the middle of December our ice runway on the temporary sea ice becomes unstable. 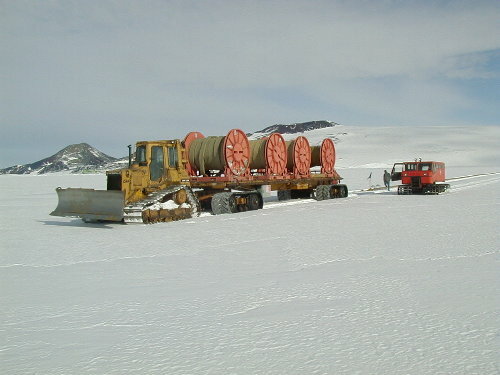 Here we are preparing to open up Williams Field on the permanent ice shelf seven miles from the station. It takes a full week for the fuels department to lay out this flexible pipeline that connects the runway to the storage tanks in town. We all rotate in for a day, as it is exhausting.